From the cutest little witch this side of Hogwarts! Mama better let me have the entire jar of cookies for putting up with this silliness! 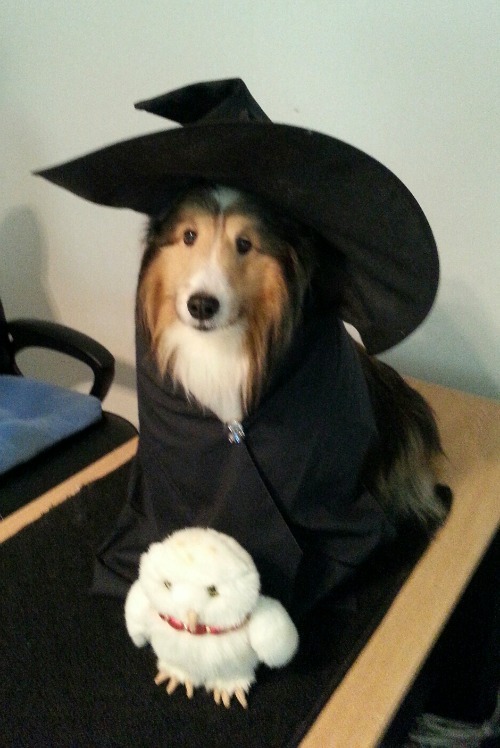 This entry was posted in Seasonal and tagged Halloween, owl, witch. Bookmark the permalink. OMG Debbie, I am smiling from ear to ear looking at these photographs of Dallas! He has, without a doubt, the cutest (and I mean CUTEST) little face of any dog ever. I just want hug and kiss him! LOVE the photographs! What a GREAT costume! Happy Halloween to you and Dallas! Mr. Ron, if you were here, I Dallas would give you lots of hugs and lickies! You know, I didn’t have a clue when Mama started posing me for these pictures. I didn’t want that hat on my head, for sure! But, she promised treats (and delivered them!) so I can’t complain. 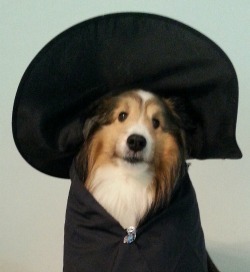 Happy Halloween, woof woof!! Oh, Dallas! You look gorgeously wicked, but we’re dreadfully worried now! Being a cat at Hallowe’en is not easy – people start expecting you to be their familiar, and if you’re not careful they start chanting spells every time you come near! Thank goodness we’re not black, but if our servant comes anywhere near us with a bottle of hair-dye she’ll be sorry! Have a spooky weekend! Tommy and Tuppence, I’ve always heard that folks who have black cats should keep them locked up inside on Halloween to protect them. I Dallas don’t even like Trick-or-Treaters in their scary costumes. And masks! Stay safe, you two, and beware servants bearing bottles of dye!! Gee, thanks, Mr. John. I Dallas am relieved the whole thing is over … and I don’t have to go to a Halloween pet dress-up parade or some such nonsense!! I’m with you as are the two boxers in our house. Thanks, Miss Lana. I Dallas was NOT down with it. In fact, Mama kept having to re-pose me and that stupid hat. If it hadn’t been for the bag of treats just out of my reach, I’d have never agreed to such silliness!! Ha ha. …He looks so mellow, though. That bag of treats does wonders, I may have to see if I can coax my dog, Sam. I Dallas wouldn’t wish that on poor Sam, but I’d love to see his costume! Well done! See it is just a matter of finding the right costume and pairing it with the right motivation. Dallas did a great job! I have a few suggestions for next year…just sayin. Why have kids and dogs if you can’t torture them a wee bit. Miss Katybeth, Mama will take all the suggestions you can offer! And so will I, you know, because she was mighty SLOW. As for the torture, well, you got that right — if she hadn’t had those treats available nearby, I’d have protested big time!! Be mighty glad to, ma’am — Happy Halloween and Hugs from us both! Dallas, you are ADORABLE!! Happy Halloween to you both! Thank you, Miss Monica. What are your two doggins going as this year? Wait, you aren’t dressing them up?? Sigh. How did I get stuck with this witch costume then?! Put a smile on my face this morning! Aw, gee, thanks for letting me know, Miss Tanya — glad to know I was able to do that today!! Thank you, Miss Dawn. Mama says I don’t have to do a pet parade or any sort of nonsense like that, so I guess dressing up for her blog wasn’t too awful! Love it! And adding Hedwig is the perfect finishing touch! Thanks, Mo. Dallas wasn’t too happy with his props, but cookies go a long way toward good behavior! I just can’t believe how cute Dallas is in that costume. It’s really quite striking. Of course I never could accomplish anything like that with Dixie Rose, but with Dallas to enjoy, who cares? Aw, thanks, Miss Linda! Mama worked really hard to suit me up and get me to stay put so she could bring you this picture.I’ll tell her her efforts weren’t for naught! He IS adorable. Now do you have a pilgrim hat for Thanksgiving that he dons? Oh, no — I don’t. But now that you’ve mentioned it, perhaps I need to acquire one, ha!